If there’s one thing we understand at The Chat Shop, it’s about engaging with customers in the places they hang out most. We’ve been having conversations with website visitors for over 5 years, generating leads, providing customer support, and converting visitors into customers for our clients. These human-led and data-driven conversations provide a high quality experience while generating high live chat ROI’s for our clients. As technology continues to grow, so do we. I’ve seen the potential in the chatbot space and have spent the last year preparing to bring an offering to our clients which meets the quality of our existing, award-winning, customer experience live chat outsourcing service. Won’t an agent experience always be better than a chatbot experience? Well, the answer to this is fairly circumstantial. While human-led digital engagement and live chat solutions can bring engagement, interaction, and convenience and humanity to a website, there are certain use cases where those qualities might not be needed (or better used in only special circumstances). Let’s look at a car dealership as an example. What if we built an automotive chatbot that could educate the customer on the range of cars available, that could arrange test drives and services all without the need for training real life agents. (SPOILER ALERT: We did it!). Often, this kind of interaction doesn’t need any human live chat agent intervention – that is to say there are no empathetic responses or decisions needing made. These aren’t unique interactions; they’re transactional and should be easy for both the customer and the company to complete. Enter chatbots. Transactional and effortless. In cases where the desired customer and company goal requires collecting the exact same set of data from each customer, we can rely on chatbots to handle these interactions fluidly, accurately, and with an exact standard that is more difficult to achieve with agents. I’ve been building chatbots that we can position in various places: Your website, of course, and perhaps more interestingly, Facebook Messenger. Did you know that in 2016, over 900 million people were using Facebook Messenger each month? If you’re not using Messenger, you’re missing interaction with all of these potential customers (even despite the recent bad PR for Facebook). But having a dedicated person to manage this channel can be complicated, require a lot of training, and is a big investment. Not to mention there are necessary restrictions on how many engagements a human live chat agent can handle at one time. How about a chatbot than can handle an unlimited number of requests at one time and answer your customers requests immediately? Sounds good, right? Building and scripting chatbots: Leave it to the pros. Building a chatbot isn’t just about throwing down some question and answers and hoping that your customers know what to ask. We’ve spent months pouring over the right recipe on how a chatbot can interact with visitors. Similar to our live chat EIM, we are using tried and tested techniques to ensure that engagements with our chatbot are fluid, user friendly, and (most importantly) take the user to your goal. We’re always sitting on the edge of innovation. We’ve partnered with ChatBot as a chatbot expert to deliver a holistic chatbot design, build, and management programme, so you’re getting best of breed technology and award-winning management! Our experience as industry leaders in live chat outsourcing has prepared us for this next step in digital engagements, and we’re keen to see how we can help you! 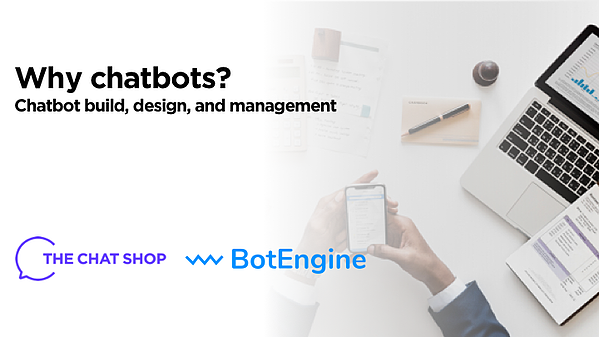 If you’d like to see an example, fancy discussing ideas, or want to talk about having a chatbot built for your site or Facebook messenger, give me a shout at bot@thechatshop.com! We’d love to chat with you more!